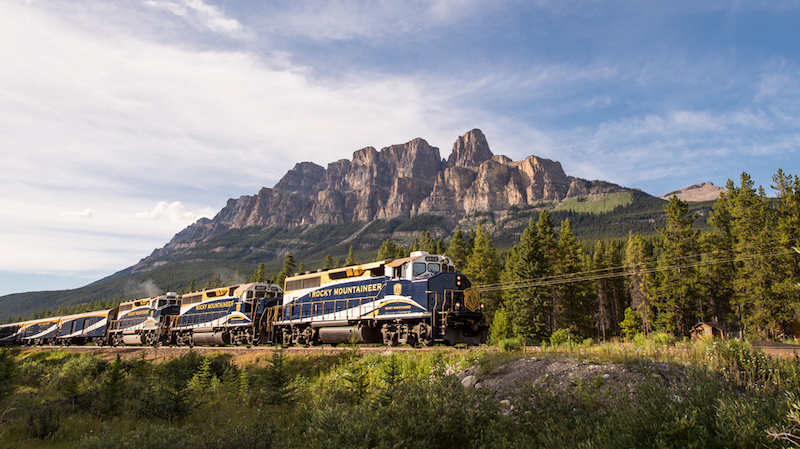 There are so many Rocky Mountaineer packages, side trips and excursions to choose from in addition to the train journey itself, so how do you narrow it down? Here’s a guide that breaks the process down into 5 easy steps and helps you choose the package that’s right for you. Just FYI: I’m a Rocky Mountaineer brand ambassador, but all opinions, suggestions and train love are my own. All photo credits Rocky Mountaineer. 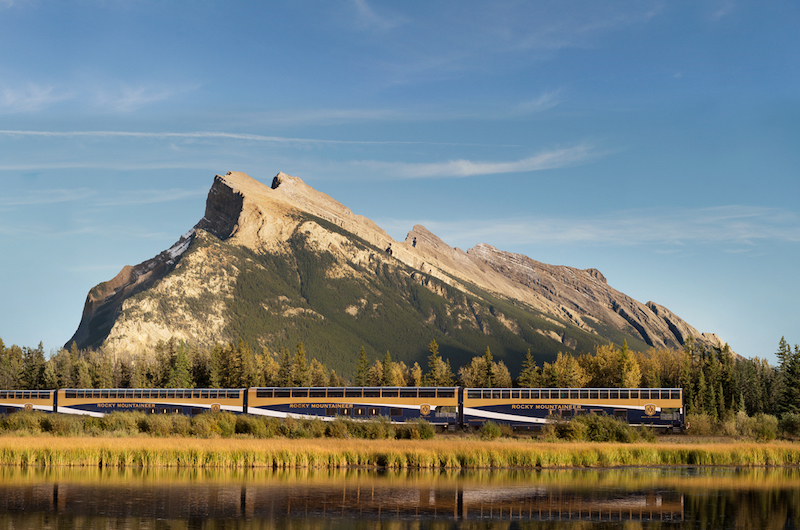 Rocky Mountaineer is more than a scenic train ride through the Canadian Rockies. It’s a step into one of the most dramatic splashes of nature on the globe, and you should make the most of it. How? By customizing your trip and choosing the package that’s right for you. Adding tours, side trips and excursions before or after your Rocky Mountaineer journey adds a whole new layer of experience to your adventure. From gondola rides up Sulphur Mountain in Banff to heli-hiking in the Cariboo Mountain Range, there are more than 65 Rocky Mountaineer packages and activities to choose from. But how do you know what package to choose? The options can be overwhelming. To help you map out your dream itinerary, I’ve broken the trip planning process down into five easy steps, and below I list some of my favourite excursions and ways of exploring the Rockies with Rocky Mountaineer. First choose your Rocky Mountain rail route. This post on Rocky Mountaineer scenic train routes will help you decide which is the best train package for you. And you’ve decided, you’ll know your start and end points. Second, look at the packages that are built around that rail route you’ve chosen. You can do that on the RM website here. Finally, pick the Rocky Mountaineer package that includes the excursions you want. If you want to customize your trip even more, talk to your travel agent or Rocky Mountaineer vacation consultant who can help you organize it. And here’s an extra step. Enjoy! If time and budget permit, I recommend extending your trip at both ends, at least for a day. You’ve come all that way – make the most of this bucket-list experience. If you’re having problems sorting through the long list of excursions and tours available – there is so much to choose from – I’ll list some of the top sightseeing points and attractions below. 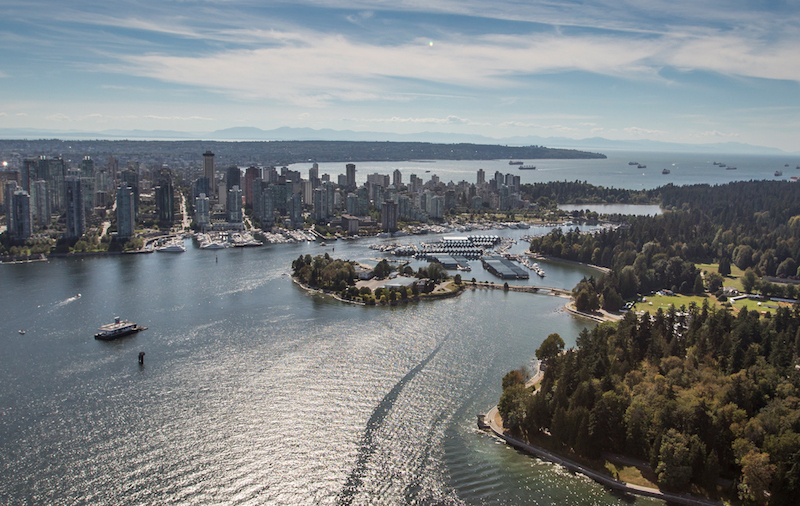 Most routes start or end in Vancouver so you’ll have a chance to explore this clean coastal city. The downtown waterfront has a wide walkable promenade with front row views of sea planes taking off and the coastal mountains beyond. Nearby Gas Town has great restaurants and Stanley Park is a stunner. To get beyond that you might want to sign up for Vancouver’s North Shore Tour. A North Shore Tour is a six-hour sightseeing tour that includes a visit to the Capilano Suspension Bridge and Adventure Park. And you don’t want to miss the bridge. Here’s why. Just as a Rocky Mountaineer vacation is more than a rail journey, the Capilano Suspension Bridge is more than a bridge – it’s an entry into a wild forest of moss, mist (at least I had mist), old growth trees and spectacular views. Other points of note on the tour are the Lions Gate Bridge, a gondola ride up Grouse Mountain and a chance to learn about British Columbia’s First Nations heritage. 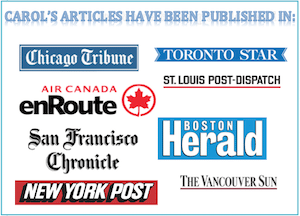 What packages include a North Shore Tour? There are a few. The six-night First Passage to the West itinerary, for example, offers a selection of Vancouver activity options including a North Shore Tour. Many people combine Rocky Mountaineer with an Alaskan cruise. I haven’t done that yet, but it’s on my bucket list. It’s really on my list. Another possible side trip is to the city of Victoria on Vancouver Island where you can go whale watching or visit the Butchart Gardens. Banff, Canada is a postcard perfect alpine town and one of my favourite places in the Rockies. Surrounded by the mega majestic peaks of Banff National Park, this picturesque town is a great place to extend your Rocky Mountaineer trip. Just try to stay out of the fudge stores on Banff Avenue – they’re addictive. Many of the First Passage to the West itineraries include a Banff sightseeing tour that stops at Bow Falls, Lake Minnewanka – a turquoise green lake surrounded by forested slopes and remote peaks – and the Hoodoos rock formations. 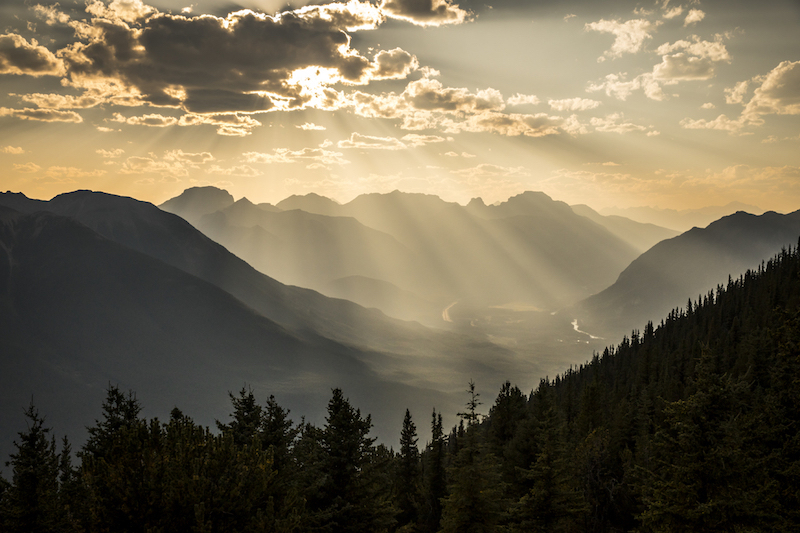 You’ll also take the Banff Gondola up Sulphur Mountain to see the sweeping panorama of six mountain ranges and the Bow Valley below – it’s a great spot to take in some of Banff’s most spectacular sights. If you want to explore Banff’s outdoors you could opt for a Bow River Float. This is a fun yet gentle rafting trip that starts at the foot of Bow River Falls and gives you a duck’s eye view of Tunnel Mountain, Mount Rundle and the Hoodoos. You don’t even get wet (although I was kind of hoping I would). Lake Minnewanka Cruise – If you have some extra time, opt for a one-hour interpretive cruise on Lake Minnewanka. A glacial lake about 5 km from Banff, Lake Minnewanka means Lake of the Spirits in the Stoney Nakoda language. At 21 km long, it’s the second longest lake in the Canadian Rockies – and that’s a whole lot of views. If you’re staying the night in Lake Louise, make sure you check out the castle-like Fairmont Chateau Lake Louise hotel. 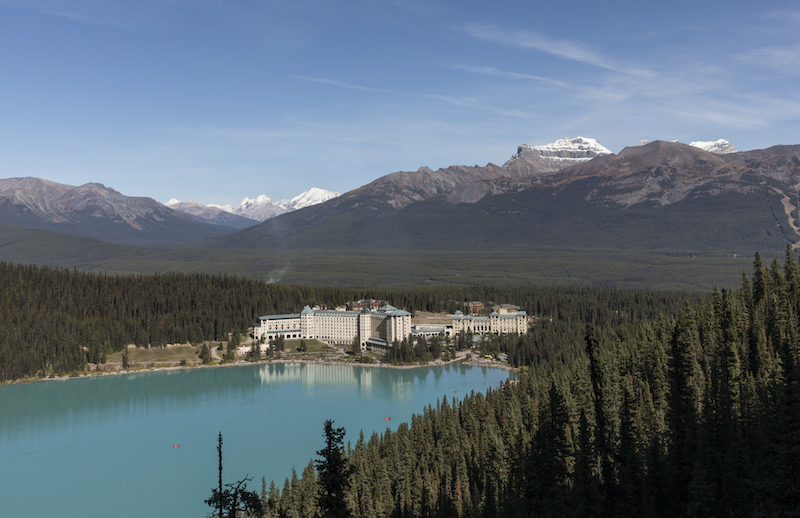 This is a historic property that sits at the foot of the gem-like Lake Louise, a lake so green you’d think the bottom was painted for tourists. (It wasn’t.) There is also a nice walking trail along the lake. Excursions: A canoe ride on Lake Louise or a hike up to the Lake Agnes Tea House are two outdoor activities that will get you breathing deep in that pine-scented air. I wouldn’t have worked for three summers at the Columbia Icefield if I didn’t love glaciers. 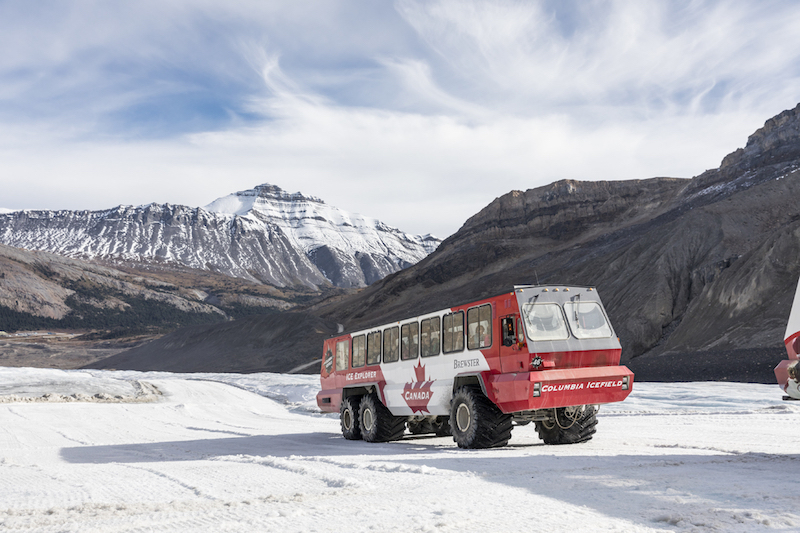 It’s not just the stop at the Columbia Icefield, one of nature’s mightiest – and iciest – creations that makes this trip so unique. The entire Icefields Parkway highway is one of the most scenic drives in Canada. When my husband and I did the Rainforest to Goldrush Route on Rocky Mountaineer, we started our vacation in Banff, took this one-day one-way bus tour from Banff to Jasper and began our train journey from there. A day tour of Jasper and its surroundings is a good way to explore this quiet area of the Rockies. After I did the Journey to the Clouds route, that’s what I did. 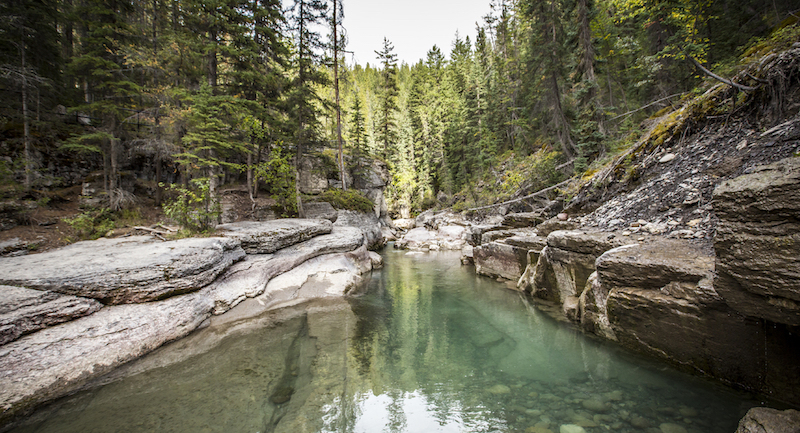 Top sights include Pyramid Lake and breathtaking Maligne Canyon with its sheer drops and rushing water that show nature at its most powerful. For a once in a lifetime experience (unless you do it twice! ), you could combine your Rocky Mountaineer rail ride with a heli-hiking tour in the Cariboos Mountain Range. Guests are lodged at the CMH (Canadian Mountain Holidays) Cariboos Lodge, then travel by helicopter to reach isolated hiking spots most people never get access to. This is one of the newest packages offered by Rocky Mountaineer, and if it’s anything like the heli-hiking trip I did a few years ago with CMH, it’s a chance to really immerse yourself in the unspoiled Rockies. Think alpine fields of wildflowers, untouched glaciers and snowy peaks. While you need to be able to hike, you don’t have to be an extreme mountain goat – there were hiking options for all levels and let’s just say mine was not advanced. You can check out this Journey Through the Clouds package with heli hiking here. So there you have it. Hopefully, these top tours and sample Rocky Mountaineer packages are enough to wet your travel whistle (or should that be train whistle?) and help put your trip planning process into easy bites. Whatever way you choose to experience it, have fun exploring the Rockies with Rocky Mountaineer. Choosing an excursion can be super confusing, so this post is really helpful for anyone planning a trip on the Rocky Mountaineer. You’ve really narrowed it down to the best experiences. We just did the Capilano Suspension Bridge and it was incredible – so much better than I expected. I’d been there many many years ago and they’ve since added the Cliffwalk – a really spectacular experience and photo-op. Narrowing down the ideal Rocky Mountaineer package can be tricky, so I hope these tips help, Hannah. 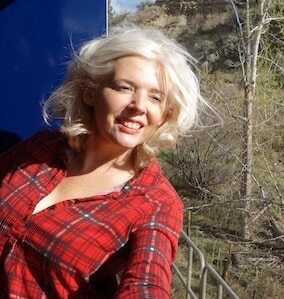 Rocky Mountain train journeys are definitely a thing, Jen. A special thing. I’d definitely exploring the Rockies a bit more if you’re doing a train trip with Rocky Mountaineer, Nell. It’s one of my favourite places in Canada. I agree, Mansoureh. Rocky Mountaineer packages are vast, varied and unique. It’s a bucket list rail trip indeed. Rocky mountaineering cmbined with an Alaskan cruise – now I really must take your lead and put that very high up on my list! It sounds incredible. Lake Louise looks stunning, and Minnewaka sounds so intriguing. I’ve never been to the Rockies, but it sounds like a special area indeed. I would love love love to do a journey on the Rocky Mountaineer. Not only do I love train travel, but I love that side of Canada. Banff was an absolute highlight. Thanks for the great tips on narrowing down the ideal Rocky Mountaineer trip! Wow, 65 packages is a lot of options! I personally would love to finally get to Vancouver and Victoria. The scenery looks breathtaking and I’d love to see some whales. I have taken this exact Columbia Icefields Parkway tour and it was amazing, I absolutely loved Banff and Jasper and they’re probably the prettiest places I’ve seen. The road trip from Banff to Jasper was amazing. I love your picture of Lake Louise, it was so lovely and blue, I remember. I haven’t been to Vancouver though, such a pity. I need to get myself there soon! Rockies are the place I really want to go and explore, but the season we go doesn’t seem to be right. October would be cold and rainy, right? Should plan for summers. And take the train! Rocky Mountaineer train trip sounds so so interesting. I should visit Canada even only for these kind of journeys. I Think Rocky Mountaineer packages are so unique. Thank you for sharing it with us and yes I make sure to choose the right PKG. The Canadian Rockies are one of my favorite mountain ranges. I had no idea that there was a tea room that you could hike to. That’s so awesome. I’m definitely going to do that on my next trip to Banff. Thanks for introducing me to Rocky Mountaineer. I never knew Canada had such an extensive railway network covering the Canadian Rockies. I would love to combine a railway tour with an Alaska cruise. I didn’t realize Rocky Mountain train journeys were a thing, but now I want to take one! What a beautiful and unique way to explore Canada. These excursions all sound incredible too, it’s got to be tough to choose between them! Banff has long been on my list of places to visit, and the Bow River Float sounds really fun. Love the idea of getting a duck’s eye view ;) The Icefields Parkway looks really cool too. The heli-hiking trip sounds incredible! How amazing to view unspoiled nature, and good to hear you don’t need to be a mountain goat to do it. Thanks for sharing about all of these ideas! Super helpful guide, it can be overwhelming on how to narrow down from the choices, so this is a great way to do that. I love this region of the world, and I’m sure i’d love to ride the Mountaineer.